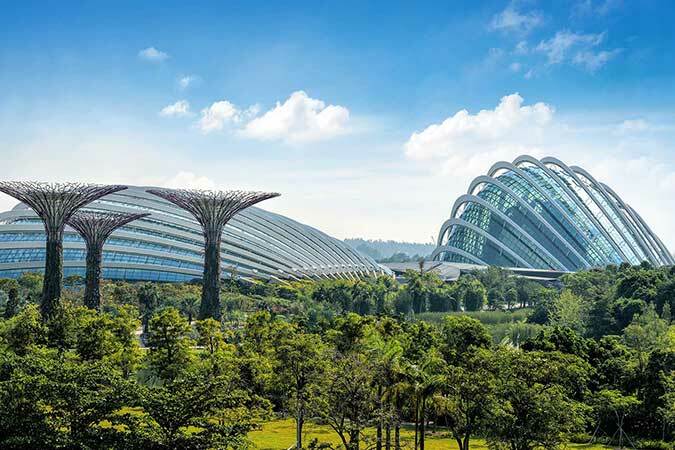 With its modern cityscape that features new-age architectural megastructures and countless skyscrapers, Singapore isn’t the first place that comes to mind when planning a back-to-nature style holiday. 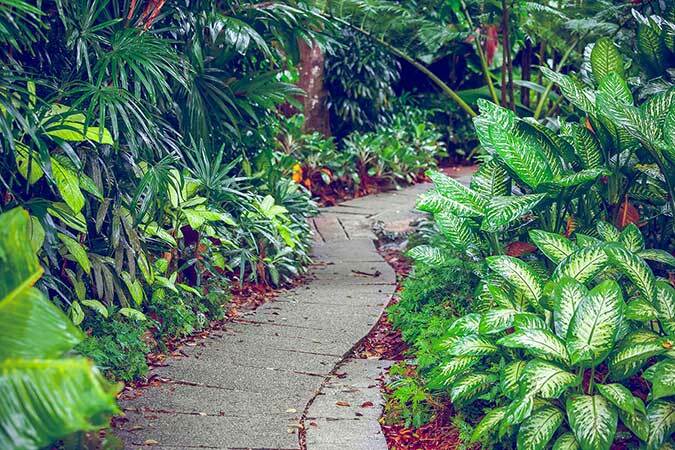 But this forward-thinking country is sometimes referred to as ‘a city in a garden’ – and for good reason! 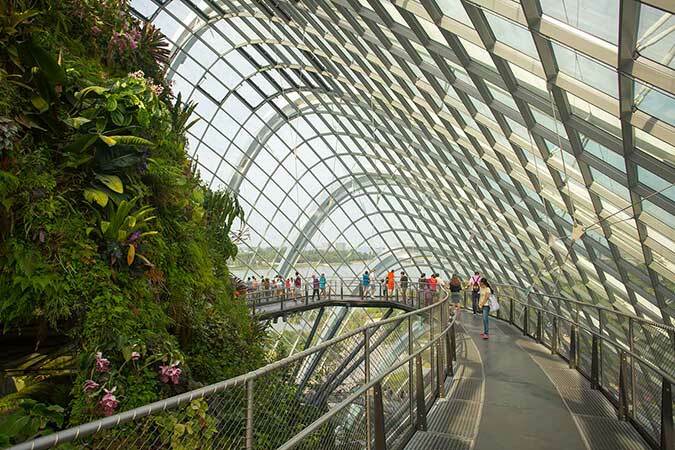 Packed into Singapore’s compact 718.3 square kilometres is a surprising amount of greenery including more than 300 parks, four nature reserves and two extensive native tree conservation zones, all linked by a 200-kilometre park connector network. In a refreshing display of the beauty of nature in an urban setting, the streets are lined with trees and even the bridges and overpasses are draped in bright flowers. Caring for the environment is an official way of life in Singapore. The country’s clean and green campaign stems back to 1963 when then Prime Minister, Lee Kuan Yew, planted a mempat tree in Farrer Circus as a symbol of his commitment to biodiversity and preserving the country’s natural heritage. 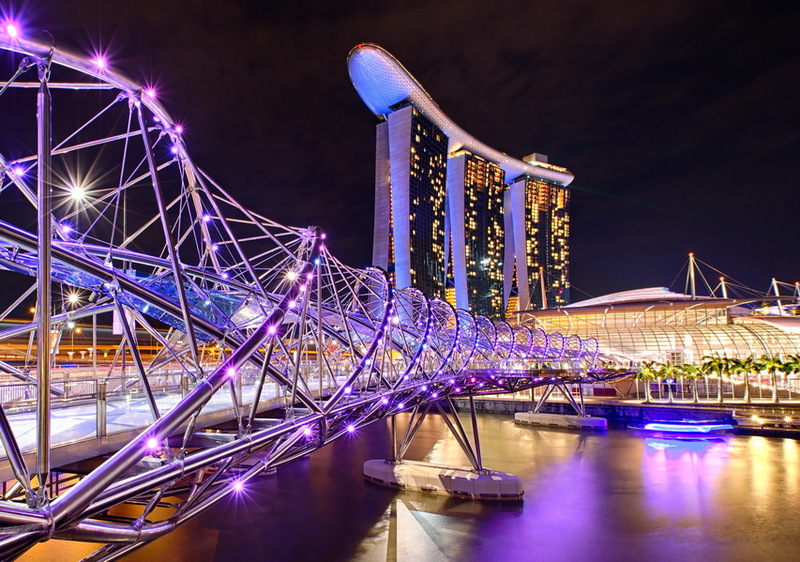 This vision has played a guiding role in Singapore’s urban development plan, with environmentally-friendly building principles (such as the rule that there must be 0.8 hectares of park space per 1,000 population) still strictly adhered to today. If you like the great outdoors but have never considered Singapore for an outdoorsy getaway, think again. 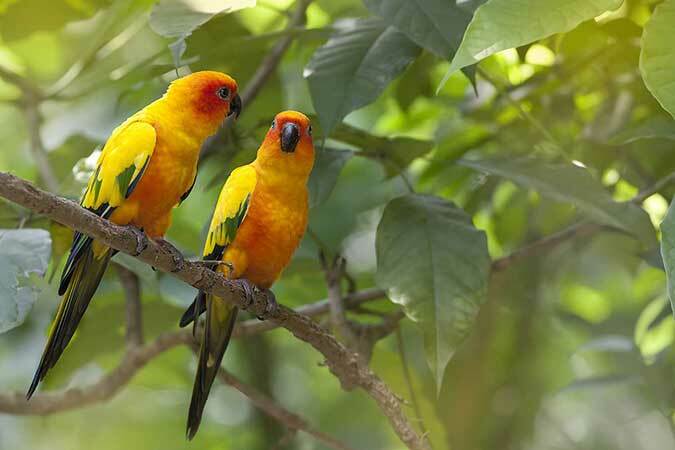 This lush country is more jungle than concrete jungle and your two Associate Resorts* – Ramada and Days Hotels Singapore at Zhongshan Park, both in Novena – are perfectly positioned to enjoy all of the natural delights on offer. 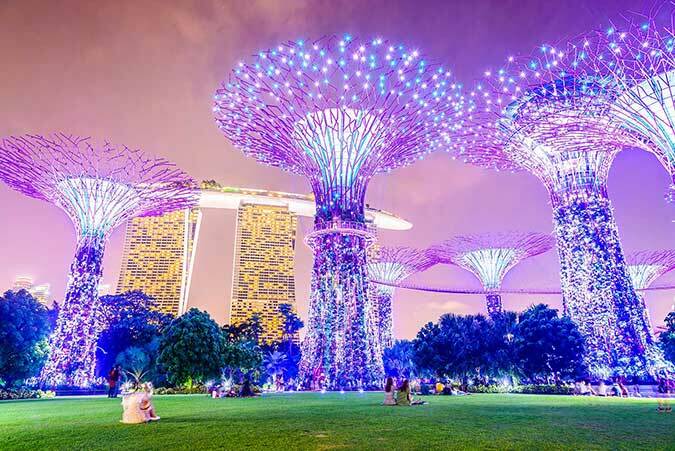 Everyone who visits Singapore will leave with a slightly different list of ‘must-see’ attractions but you can bet that Gardens by the Bay appears in most people’s top five! Located on the waterfront next to the Marina Reservoir, the sprawling gardens boast manicured lawns, landscaped gardens and tropical palm trees, and play a key role in the country’s clean and green campaign. 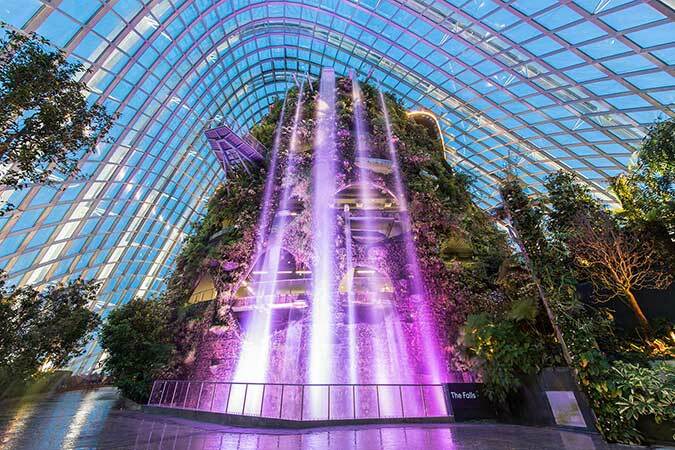 True to Singapore’s creativity and innovation, Gardens by the Bay is a landmark of artistry and futuristic horticulture. Not your typical garden, it features a scattering of 16-storey ‘supertrees’ that are made from environmentally sustainable functions and materials including photovoltaic cells to harvest solar energy. At dusk, spread a picnic blanket on the grass and lie back to enjoy Garden Rhapsody, a dazzling light show accompanied by music that takes place nightly in the canopy of the supertrees. Be sure to also check out Gardens by the Bay’s other key attraction – two giant domes that artificially replicate different environments. The Flower Dome imitates the cool-dry climate of Mediterranean regions like California and Spain and houses more than 32,000 plants, while the misty Cloud Forest takes you 2,000 metres above sea level to the tropical highlands of a 35-metre mountain covered in lush vegetation and the world’s tallest indoor waterfall. 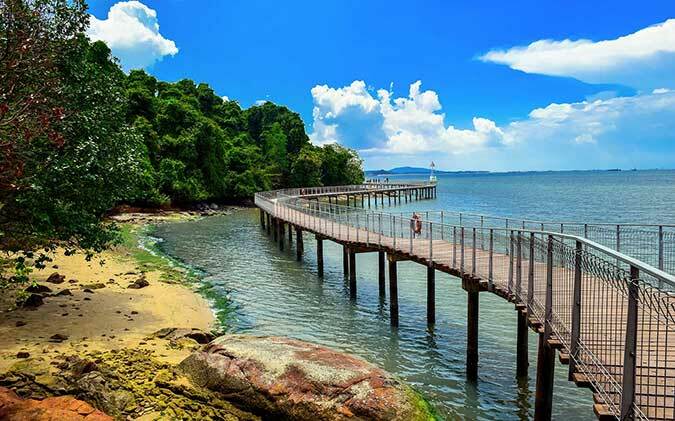 Singapore’s warm, humid climate conjures fantasies of a trip to the beach and luckily a ten-minute boat trip (for just SGD$2.50 each way) from Changi Ferry Terminal takes you to the tropical paradise of Pulau Ubin. According to local folklore, the island was formed hundreds of years ago when a pig, elephant and frog challenged each other to swim across the straits between Singapore and Malaysia. The animals agreed that those who failed to reach Johor in Malaysia would turn into a rock. Unfortunately all three animals overestimated their swimming capabilities and the elephant and pig drowned, reappearing as Pulau Ubin. The frog didn’t make it much further and is today remembered as the nearby rock formation, Pulau Sekudu. This quiet, uncrowded island is not only a great way to escape the heat, it is also the ultimate day-trip destination for nature lovers and exercise enthusiasts. Home to a variety of environments including lush rainforest, cool mangroves and sandy beaches, the best way to see the island is either on foot or on bike, although taxi drivers are also available. Follow the bike paths and explore untouched reservoirs and the island’s permanent residents’ humble Sensory Garden, where you’ll find thriving herb and vegetable beds. Don’t forget to pack your camera because you’re bound to spot native wildlife including wild boars, monkeys and birds along the way. Visit the tourist information centre to learn about the island’s history and enjoy stunning views back over Singapore from the coastal boardwalk that snakes its way along the stunning beachfront. Refuel with a modest but delicious lunch and refreshing beer at the island’s one restaurant before returning to the mainland. 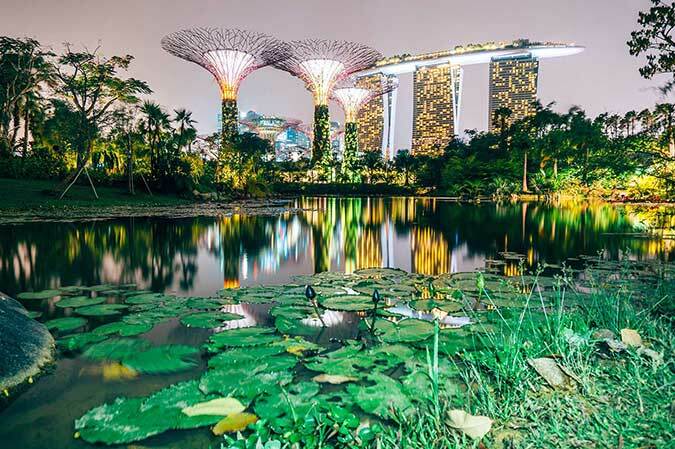 Approximately four kilometres from Ramada and Days Hotels is Singapore’s oldest reservoir, which is enclosed by tranquil gardens and parks and an expansive nature and animal reserve. MacRitchie Reservoir is the perfect spot for a morning picnic on the grassy banks of the water followed by a spot of fishing or kayaking. For the more intrepid travellers, the park includes an 11-kilometre rainforest walk known as the MacRitchie Trails, where wild monkeys, squirrels and water dragons abound. The two highest points within the park are connected by a 250-metre free-standing suspension bridge, which offers a bird’s-eye view of the lush rainforest canopy. Not a single high-rise is visible from within the park, making it easy to forget you’re in one of the most densely populated cities in the world! *As a CLUB WYNDHAM ASIA Member you have the opportunity to travel to a range of great holiday destinations staying at Associate Resorts, an additional benefit offered by the Club Developer, Wyndham Vacation Resorts Asia Pacific (HK) Limited. Resort, room facilities and standards may vary. Some properties may have a minimum night stay. Resorts may be modified or removed at any time without notice.